The long-running German one-man-band let us down rather with 2011's Tiurida, so it's a pleasure to be able to report that Falkenbach's sixth full-length Asa is a return to form for Vratyas Vakyas. This sort of Viking-themed folk metal really lived or stands on the atmosphere it creates, and as you'd suspect from the rather lovely cover art, Asa delivers. First track Vaer Stjernar Vaerdan opens with early-90s choir-like keyboards and opens up into a catchy melody with simultaneous metal riffs and acoustic strums. Vakyas sounds in good voice, his clear vocals among the best I've heard from him, and of course the music (mainly performed by Vakyas but with a drummer and added violinist and guitarist) is top-notch. The following Wulfarweijd even sees the return of harsh vocals, together with the speedy riffing of the track adding a touch of excitement to proceedings, but it's Mijn Laezt Wourd where the album really begins to take off, the slower pace and melancholic air worked in well to a catchy song. Fans will be delighted, really, and newcomers will find much to like. Bronzen Embrace builds on the blackened elements introduced early with an added epic oomph to entice Summoning fans from the Tolkien role-playing board over to the Viking campfire. Said campfire-feel is evident in a few places, some of the songs having a sing-song feel to them, particularly the slower but very catchy Eweroun, which takes time to allow the acoustic guitar to shine. And the songwriting, and way in which Vakyas keeps the songs interesting and diverse, is always at a high quality, the speedier Stikke Wound being followed by the slower Ufirstanan Folk, and so on. 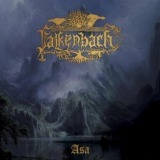 Although every folk metal fan has their own preference for the genre, my favourite aspect of Falkenbach is the perfect incorporation of acoustic instruments without making them feel like an afterthought, and so I was well taken care of with Asa. Perhaps not the best album to come from Vakyas' pen, but one of the most solid, and given that 2014 marks the twenty-fifth year of Falkenbach's existence, quite a triumph. Here's to another twenty-five.